Once again the Radio Ecoshock bank account has drained down over the summer to a couple of hundred bucks. The costs of making and distributing the program, plus bankrolling free downloads of all past shows (to people all over the world!) continues. Most of the time, I keep my head in the science and activism, working at least 40 hours a week to bring you Radio Ecoshock, with 45 new shows a year. Our non-profit radio stations do not pay me. I cannot ask for funding on those stations. So it falls to you, my loyal blog readers, to keep me going, and this project going. Before you dive into this week’s show, can I ask you to help me? 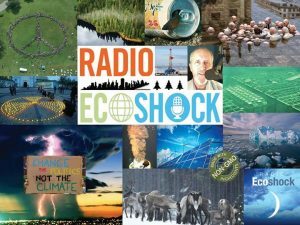 On this page, you can decide on either a regular monthly donation, or a one-time gift, for Radio Ecoshock. Without your support for this citizen-based journalism, I can’t keep providing this service. 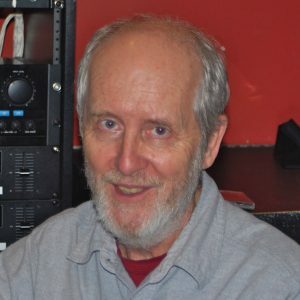 Please help Radio Ecoshock if you can! The verdict is in, from space and from the ground. The world’s tropical forests are releasing their masses of carbon into an already over-loaded atmosphere. It’s a climate signal as big as the melt-back of Arctic sea ice. You will hear breaking science from NASA and Woods Hole. In the face of inevitable disasters to come, we also have Daniel Lerch from the Post Carbon Institute to talk about resilience in a time of upheaval. I’m Alex Smith with three new interviews, let’s get going. While we live and sleep, in space NASA operates an Orbiting Carbon Observatory, or OCO. Actually this is version 2, launched in 2014, after the first one malfunctioned during deployment in 2009. Now scientists have announced a wave of new findings about the way carbon works in our atmosphere. In times of rapid climate change, this is need-to-know information. NASA has released five studies in one, from 21 scientists, by my count. It’s huge, and all published in the journal Science on October 13th, 2017. Fortunately, we have as our guide a lead author with an overview. 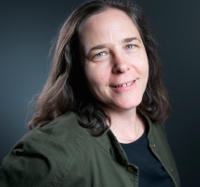 She is Dr. Annmarie Eldering with the Carbon Observatory project. From the NASA Jet Propulsion Lab in Pasadena California, we welcome Annmarie to Radio Ecoshock. One of the papers, by study by Junjie Lieu et al. reveals the biosphere lost 2.5 gigatons more carbon from the tropics in 2015, than just four years earlier in 2011. Such a big shift within a recent four year period is a stunning climate signal, on a par with the 2007 disappearance of Arctic sea ice. How long will it take before the public gets this big message? The carbon regime in the tropical forests has “flipped” from a positive force to regulate the carbon, and therefore climate, to a negative one, which speeds up climate change. In addition to the on-going progression of climate warming, the authors conclude the main driver was the 2015 El Nino event. The whole team was fortunate to get their Orbiting Carbon Observatory into space just the year before, in 2014. They had the ultimate experiment on the Earth unfolding before their eyes and instruments. But the El Nino event brought three different impacts to three different continents. In the tropical forests of South America, including the Amazon, the problem was drought that killed off so much vegetation, thus releasing excess carbon. In Africa, it was more the heat, that brought on carbon loss. Meanwhile in Indonesia, the fires struck, releasing extra carbon there. All three are the same impacts we expect to become more and more “normal” as climate change develops. So NASA has helped us see the future, even as an unexpected burst of carbon has already left the tropics to reside in our atmosphere for up to 100,000 years. As Annmarie summarizes the findings from five papers, we discover a simple fact that I certainly never knew: when plants perform photosynthesis, they also emit light! I’ve never seen plants light up, but “Solar-induced chlorophyll fluorescence” can be detected by scientists on the ground with spectrometers. It can also be measured from space, and those light patters can even tell scientists the type and amount of ground cover. Amazing. In another study, the Austrian volcanologist Florian Maximilian Schwandner led a team that managed to show two more capabilities of the OCO-2 satellite. This NASA satellite is more advanced than the Japanese Greenhouse gases observing satellite, or GOSAT. NASA’s new bird has higher resolution, which allowed the Schwandner team to monitor the carbon emissions of just one city – Los Angeles. Nobody has seen that kind of carbon accounting detail before. Schwandner was also able to measure the carbon emissions from just one volcano in Vanuatu, South Pacific. While we know volcanic eruptions can cool the planet with particles for a year or two, the long-term impact of these volcanoes is actually adding to global warming. A lot of carbon and other greenhouse gases come out of them. Now we can figure out how much. The OCO-2 is limited to a small swath of the Earth, less than 5% of the globe, as it passes over. But what it sees it sees in detail, showing the capabilities we need to know what is really happening on Earth, as we shift the climate into a new state. In my opinion, this collection of 5 papers is probably the biggest science news in the last 6 months. You can read more about it here in the Los Angeles Times last week, here from the BBC, and here from Space.com. For a very long time, carbon has been taken out of the atmosphere by the plant world. We count on those services from the vast fabric of tropical rain forests. But all that has changed. New science proves “Tropical forests are a net carbon source”. 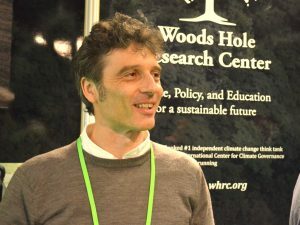 Our guest Alessandro Baccini is the lead author of that paper published September 28th in the journal Science. Dr. Baccini works at the Woods Hole Research Center. He specializes in analyzing Earth from space using satellites. The title of the paper is “Tropical forests are a net carbon source based on above-ground measurements of gain and loss“. Now we have a number for the amount of carbon lost from tropical forests to the atmosphere each year: 425 million metric tons. That is more carbon every year than all traffic in the U.S., according to these researchers. It’s a staggering amount of carbon, but so far less than the greenhouse gases emitted by countries like the United States or China. The harsh news is beyond human emissions, global warming itself will further damage the forests, thus creating a positive feedback loop. Scientists expect emissions from the tropics to increase, unless we take action to restore forests, while slashing our own emissions. There is another result in this study that surprised me. When we talk of losing carbon services, we tend immediately to think of deforestation. But you say almost 70 percent of the net carbon loss comes not from deforestation, but quote, a “reduction in carbon density within standing forests”. Apparently a forest can become degraded or disturbed without cutting down trees. You can read more about this new study in the Washington Post here, and the Guardian here. “Resilience” is a key word for a spectrum starting with collapseniks all the way to big city Mayors and regional planners. But what is it? Has anybody thought this through? Enter “The Community Resilience Reader” from the Post Carbon Institute. It’s billed as “Essential Resources for an Era of Upheaval”. We’ve certainly got the upheaval. I’ve reached the book’s editor and co-author Daniel Lerch. 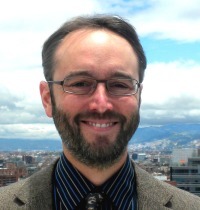 Daniel was featured on Radio Ecoshock in 2009, from a conference called “Gaining Ground/Resilient Cities”. He’s been on this beat ever since. We welcome Daniel Lerch welcome to Radio Ecoshock, from Guadalajara Mexico. 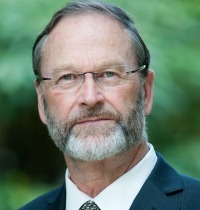 We start with a no-nonsense scholar from British Columbia, Dr. William Rees. Bill contributes a chapter that asks what we all wonder: “Does Human Nature Drive Us toward Collapse?” Daniel talks to us about our apparent inability to steer away from the cliff. After outlining our dire challenges, the Reader turns to working solutions. There is a joint essay by Sarah Byrnes and Chuck Collins from the Institute for Policy Studies. In an article “Rocky Times Ahead: Are You Ready?” in “Yes” magazine, these two write about organizing outside political and business circles. These days it may be called a “common security club“, but there is a precedent in previous hard times. During the Depression of the 1930’s, thousands of “Townsend Clubs” and other groups organized to self-help with unemployment and poverty. One step taken in this book is titled “Systems Literacy: A Toolkit for Purposeful Change”. If we want to change the system, the authors suggest, we better learn how “systems” really operate. I object to a quick definition of “resilience” given by co-authors Brian Walker and David Salt. They write, quote: “Put simply, resilience is the ability to cope with shocks and keep functioning in much the same kind of way as before“. But I think we definitely should NOT aim to keep functioning as before. That’s what every politician promises: after the disaster, we’ll rebuild the roads and go on with business as usual, which is deadly for us and the planet. Daniel Lerch explains that was the “quickie” definition, and both the book and the article authors are well aware of the ways we need to change. Maybe we don’t need to “bounce back” we need to “bounce forward” or “bounce very differently”. Here is some of my own thinking. A new book is out saying Donald Trump is mentally ill. But our whole society is mentally ill. We burn fossil fuels and do all the things that wipe out species and wreck the planet. How can we build resilience within that massive social illness? Some events, like an asteroid strike or nuclear war are so cataclysmic that few survive to bounce back. Would you agree there are limits to what resilience can help with? In the face of rising seas, super-storms, and super-fires, we may have to re-think what “resilience” means. Everyone pictures rebuilding communities. There are times when the sane response is not to stay and rebuild, but to run, to become a refugee. I’d say that “resilience” has to accommodate a lot of threats, and possibly different responses. “The Community Resilience Reader – Essential Resources for an Era of Upheaval” is published by Island Press. We are out of time. Please join me again next week for more Radio Ecoshock. And please, if you can help support the show, now is the time!